Cricket’s latest addition to their Android lineup is a budget slider from Samsung. The new Transfix is just $179.99 on the carrier’s pre-paid phone plans, and should be available from both the online Cricket store and retail locations later today. The company announced the new phone via a press release this morning. The Samsung Transfix might not catch the eye of those looking for the biggest and baddest in the Android world, but for shoppers looking for a prepaid phone that covers the basics and has a full QWERTY keyboard, it should fit the bill nicely. The 3.2-inch screen is matched by a 3.2-megapixel rear camera. Cricket didn’t mention how much on-board storage is included, but the MicroSD card slot tops out at the standard 32GB. Gingerbread 2.3 and access to the Android Market are thankfully included, and the small screen resolution shouldn’t be a problem for the 800MHz processor. Eagle-eyed readers will note a passing similarity to the Samsung DoubleTime announced by AT&T yesterday. While that phone’s QWERTY keyboard flips out from the bottom like a Motorola Backflip, this one has a standard sliding keyboard. 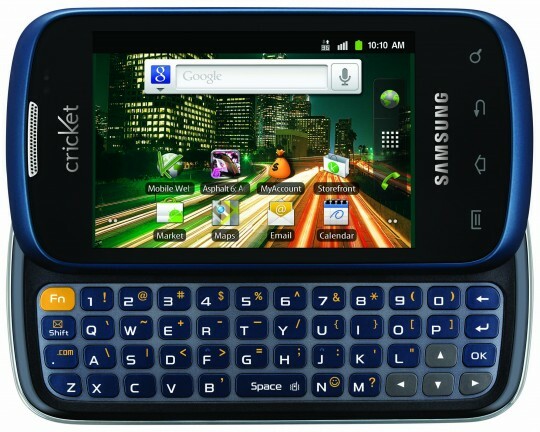 Budget-conscious Android fans can pick up a Samsung Transfix on Cricket starting today.